In an age where mobility is king, it’s a wonder that our mobile devices can't yet be fully powered by solar energy. But now, for (ALMOST) the first time ever, there is a laptop out there that is fully functional running only on solar energy. It is called the SOL, and it’s a sturdy kind of a laptop. The SOL is a solar powered laptop. It never needs to be plugged into the grid. It's rugged, incredibly fun to use and most importantly, it is affordable. SOL was developed to enhance education in developing countries but is also great for all adventurers around the world. Its unique design allows you to take SOL with you wherever life takes you. 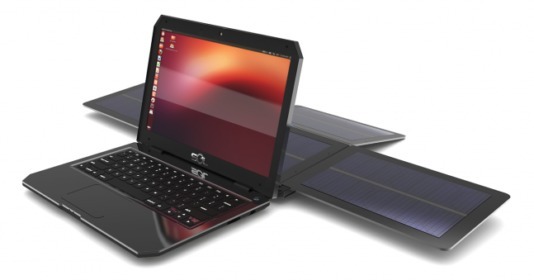 The Ubuntu Linux-powered computer is equipped with a detachable solar panel, which the developers claim will provide up to 10 hours of battery life after just two hours in the sun. Frankly, it is not the first solar computer out there, but none of SOL's predecessors are as energy efficient. WeWi, the company behind it, claims the SOL never actually needs to be plugged into an electrical outlet to charge, but it still has the option in case you need to keep working late into the night. The solar panel can even detach and connect to an extension cord, so you can use the computer indoors and still keep it charged with direct sunlight. However, according to the developers, each SOL computer could prevent approximately a ton of CO2 emissions from being released into the atmosphere during its lifetime simply by not charging it exclusively through a power socket. The SOL houses an Intel Atom D2500 1.86 GHz Duo Core processor with an Intel 945GSE chipset. Users will have access to 320 GB of HDD storage as well as 2–4 GB of DDRIII SDRAM. It will use a built-in Intel GMA3600 graphics card with a 13.3 in LCD HD screen, and includes a few options for connecting to the internet, such as Wi-Fi and 3G/4G/LTE, plus connections for GPS and Bluetooth. Customers will even have a choice to add a satellite communications module for especially remote areas. The company is determined to make the computer as accessible as possible, which is why it plans to distribute two versions worldwide at a budget price of US$350 or $400 for the water proof version.